With today’s skyrocketing real estate prices, most Pinellas County homeowners need to squeeze in as much function into every square foot of their home as possible. Many people are hoping to add a home office, music or art studio, or a home gym, but are stumped when it comes to finding the space. Where can you find this room within your space if it already feels too crowded? We sat down with one of our of our newest team members, Jacy Bailey, to learn about some of the trends we can expect in 2019. Whether you’re looking to completely remodel, or simply incorporate a few trends into your kitchen, McCabinet has the experience and design expertise to make your vision a reality. What are the biggest trends in cabinetry for 2019? In 2019, I think we’ll continue to see more and more mixing of colors and textures in the kitchen. 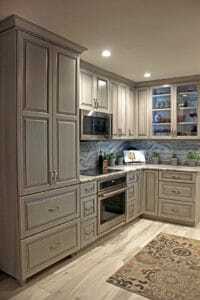 For example, painted cabinets surrounding a beautiful, rich, wood island. We are also seeing people putting in microwave base cabinets versus the traditional over-range microwave. This allows for a decorative hood and more elaborate backsplash. What are you hoping to see more of in 2019? I am hopeful that we’ll continue to see more and more people bringing wood elements in to their kitchen. I love the look of natural hardwoods, and incorporating a wood hood, island or butcher block countertops brings in such warmth. What is your favorite trend looking in to next year? As much as I love white, and appreciate its timelessness, I am so excited to play with darker, moodier colors and stains. Darker paints and stains are really on-trend for 2019! Are there any safe bets that will always be in style? You really can’t go wrong with clean and simple designs and details. Really pay attention to creating a functional space; as long as the design is efficient, it will stand the test of time. How do I incorporate more than one trend simultaneously? Try to create a few features that are special to you. Your kitchen designer is a pro, so you can really depend on them to bring your vision to life and make everything work. The key is to work on selecting items that complement each other. For example, select drawer pulls that accent the cabinet style. How do I incorporate some trendy items with my current style/decor? You can easily update drawer pulls and cabinet hardware. This is a really simple, easy way to bring in trendier updates without having to re-do your entire kitchen. You can also incorporate a new color by painting an accent wall. If you have a little more time and energy, look at replacing lighting or even your backsplash. While a little bit more of an investment, these things have a huge impact! Schedule an appointment to speak with a designer today about your design goals in 2019! We sat down with lead designer, Tricia Guy, to learn some tips and tricks for customizing your kitchen and incorporating your personality in to your other spaces. What can I do to add personality in to my kitchen? There are a few things you can do to add personality to your space. One of the easiest ways is to add your favorite color to an accent wall. Another suggestion is to incorporate a theme, or hobby you love. What are some neat things you’ve seen families do to incorporate their unique personality into their spaces? There are so many options to add your personality in to your space to really make it shine. One of my favorite kitchens that I worked on was for a woman who loved jewelry. We were able to select jewel embellished hardware that really reflected her love of all things sparkly. I also had a gentleman who loved fishing, but his wife hated all his fishing gear lying around. We were able to incorporate rotating storage unit behind doors so that all of his fishing gear was easily accessible, but hidden out of sight. Everything looked clean and tidy. Now, for something fun outside of the kitchen… I worked with a couple who loved dogs. We incorporated photo printed tiles in their laundry room backsplash. It was adorable. You can always incorporate patterned or printed tiles in to any room in your home. It’s always important to remember to think outside the box and get creative. What can I expect at my first appointment/consultation? Is there anything I should bring to a consultation to help describe myself and my needs better? Bring anything that helps describe your likes and dislikes. Photos speak volumes. Inspiration can come from a vacation, a magazine article or advertisement, or Pinterest just to name a few. Collect your ideas and share them with your designer! I am redesigning my kitchen on a budget. What are some lower cost options to really help personalize my space? Take one element in the room, like countertops. 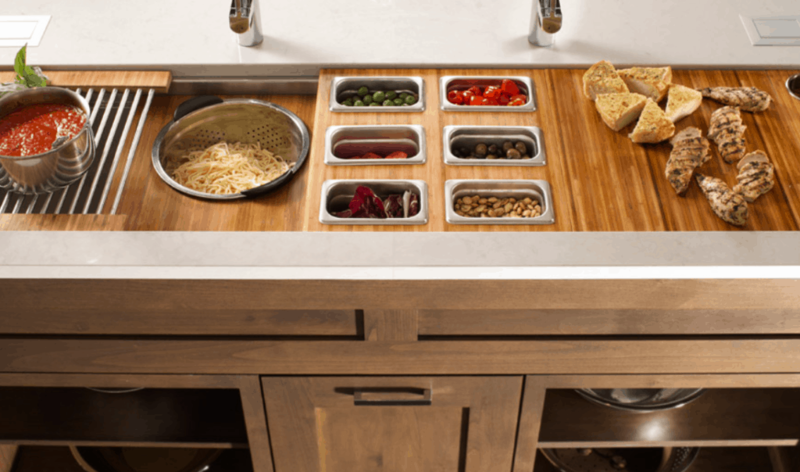 Maybe your counters always look cluttered, so a new storage option would be a good bang for your buck. In this case, I’d suggest finding some unique containers to use for storage. Maybe the containers you find aren’t meant for kitchen storage… so what?! Give them a try! You’d be surprised how bringing in unexpected elements can liven up and personalize an otherwise boring or dated space. I’m not able to do a full kitchen remodel, but want to add some personality in to my space. What are your best tips on a budget? Start by looking at your lighting. Updating your lighting can make a huge impact. Recessed lighting can easily make low ceilings look higher. 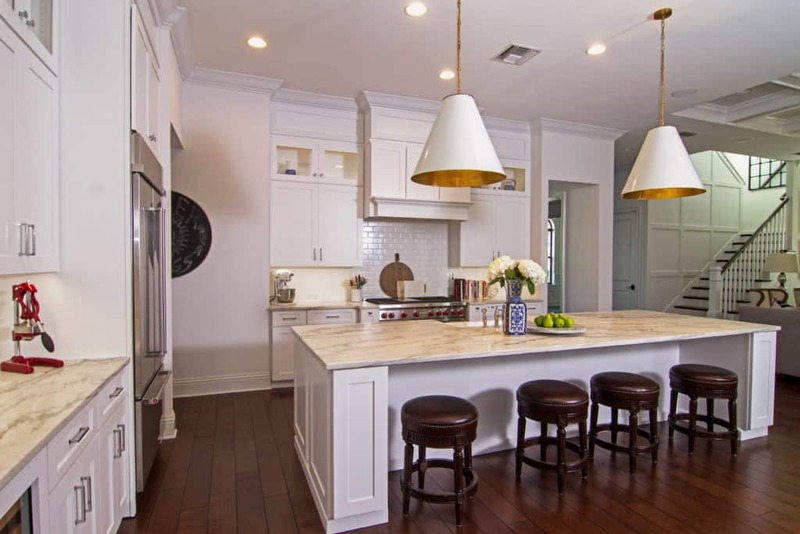 Adding a new fixture over an island or peninsula can also add a real “wow” factor. There are some beautiful island lights and pendant lights available on the market at a low cost that can update your space so simply and elegantly. Another option to explore is updating your hardware. If it’s too expensive to update all hardware, you can always start with hardware on your upper cabinets and pantry. You can also repurpose furniture for kitchen use. An antique chest can turn into storage, for example. I love using unexpected pieces in the kitchen. There are so many options to personalize your space. Let the experts at McCabinet help you define your likes and must-haves to create a beautiful and functional custom space in your home. Hiring the right kitchen design company is one of the most important decisions you will make when renovating of your home or office. You must feel confident in your choice of kitchen designers and avoid making a hasty decision based on low prices or fast results, as these can oftentimes mean low quality work product. 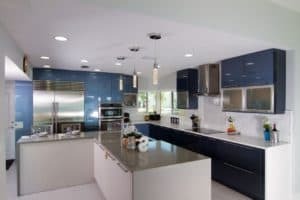 Taking the time to learn how to choose a kitchen designer in the Tampa Bay area will ensure that your new kitchen will exceed expectations with stunning results. When researching kitchen designers in Clearwater and surrounding cities, we suggest taking note of their online reviews through the Better Business Bureau and on their company website. Review their credentials to ensure the kitchen design company you are considering holds the required licenses from the state of Florida and any local municipalities. Those who have earned previous recognitions, awards or certifications get bonus points on earning trust, of course. Reading testimonials on any of the multiple user rating platforms available online, such as Google, Yelp, or Facebook, can be another way to research the credibility of a kitchen design company. gain opinions on their work from past customers and clients. Bank on what others have said about the designer’s work and then meet them to see for yourself. The last thing you should worry about is an incomplete or poorly designed job, leaving you with lost money and time. Interviewing your potential kitchen design company is a great way to determine what exactly you are looking for during your home remodeling project. 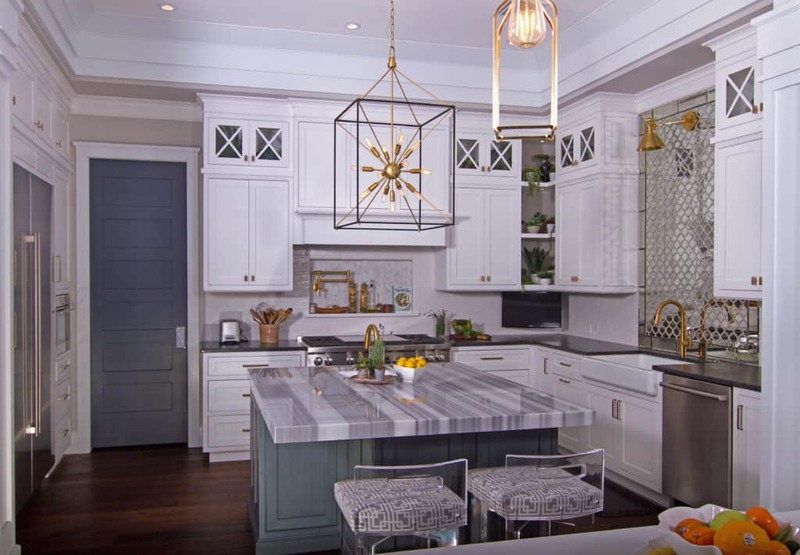 Cabinet retailers and kitchen designers often have different approaches to the task at hand, so learning how a potential home design partner will approach your project will determine if they’re a good fit for you. Make an effort to notice how the company answers your questions, as this will show you their dedication and commitment to the job, and to your satisfaction as a customer. Focus on their willingness to set up a time to communicate, as well as their interest in your vision for the final product. Be prepared to answer questions as well, as the interview could go both ways! After selecting a kitchen designer for your home improvement project, take the time to fully read through the documents they have prepared before signing a contract. Once you agree with the terms, congratulations! Your diligent research has paid off and you will be left working with a trusted contractor toward high quality results. When selecting a kitchen design company for your next home renovation project, consider the craftsmanship and reputation of McCabinet, with unmatched testimonials and a long-standing tradition of churning out awe-inspiring home kitchens and bathrooms with the finest cabinetry on the market. We look forward to the opportunity to WOW you with our showroom and past work, as well as the valuable chance to meet you and discuss your kitchen dreams. McCabinet believes that beautiful cabinetry belongs in every room of your home. Learn how our interior design specialists can help you conceptualize the ideal remodel for your kitchen.